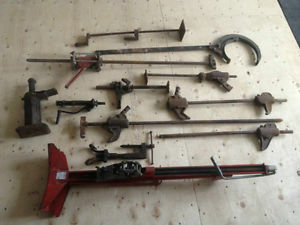 Antique Automotive, Boating & Railroad Paraphernalia tools or decorations etc. 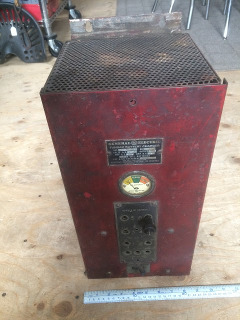 1926 Tungar stationary battery charger, made by General Electric. 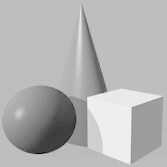 This was the gas staion model that hanged on the wall. It could charge up to six 6 volt batteries at a time. It has the old porcelain connectors on the side where the knob and tube wires went in, it runs on 115 volts AC, charges 6 amps DC. measures 8 1/2" x 8" x 18", it weighs 34 lbs.. asking $220. 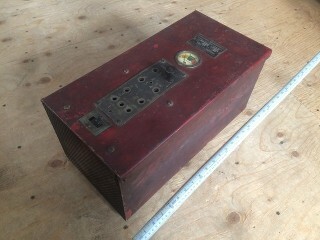 1921 Tungar portable battery charger, made by Canadian General Electric. Its for charging 6 volt batteries. 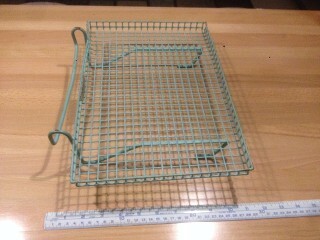 It measures 10" x 10" x 15" high with the handles. 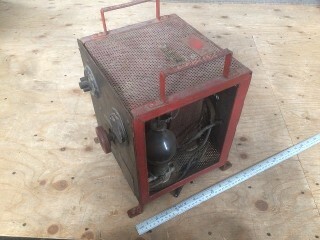 This one has the special tungar bulb in it and weighs 60 lbs. asking $120. 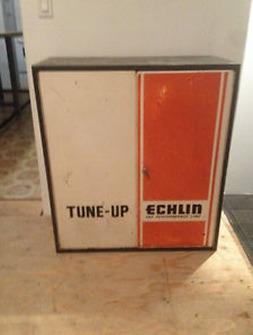 Vintage Echlin the performance line tune up parts cabinet. Mechanic's parts cabinet, It measures 32" x 36" x 13 1/2" (Sold). 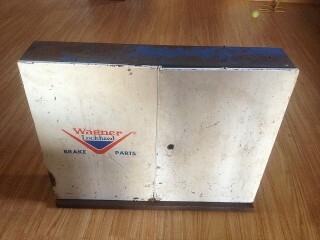 1960's Wagner Lockheed brake parts cabinet,with 1958 to 1967 Wagner Lockheed parts brochure that was in it. It has 5 small shelves inside and measures 30" x 24" x 6", asking $120. Large heavy aluminum sign in aluminum frame with Echlin's brown and orange colors. It measures 3 feet high by 6 feet long and weighs 40 lbs. $80. 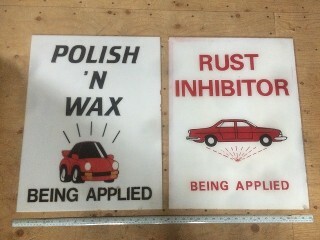 Vintage plexiglass car wash signs, 19" x 25", asking $40. For the pair. 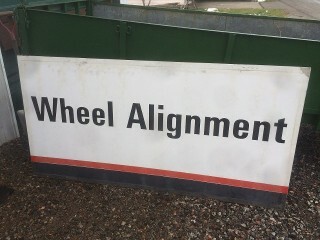 Large heavy aluminum sign with Echlin's brown and orange colors. It measures 3 feet high by 6 feet long . Asking $60. 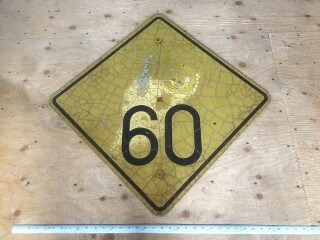 Road hazards steel sign, 35 1/2" x 12" , asking $45. 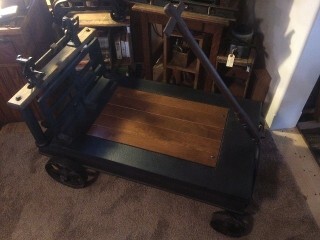 Antique horse drawn buggy carriage, sleigh or model t Ford steps, asking $35. each. 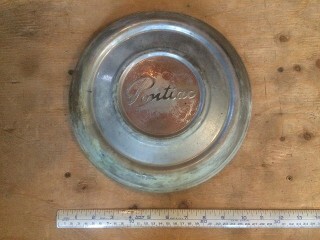 Antique Pontiac hubcap, 10" diameter, asking $20. 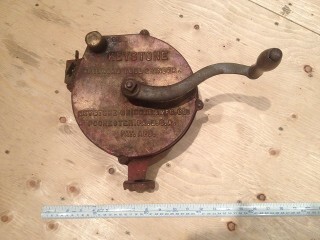 J.C. Moore & Co. Racine Wis. Tire jack, Patent Jan. 14, 1908, asking $45. 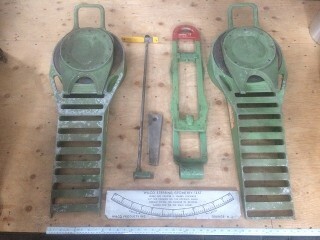 Vintage Wilco wheel alignment system, all made of heavy gauge aluminum, ramps, ball bearing turn plates, and accessories, wieghs 55 lbs. (Sold). 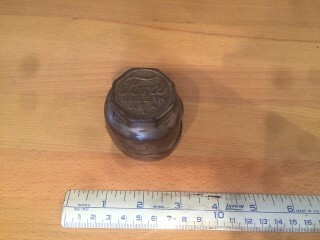 Antique Ford copper grease cap, 2" diameter x 2" high, asking $20. 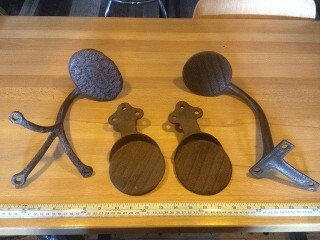 Antique cast iron, bolt-on oil can holder, 3 3/4" diameter, asking $30. 1.) Unity MFG. 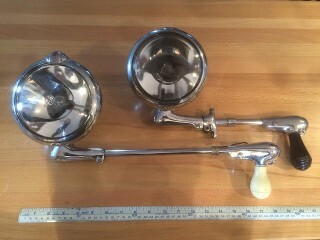 Co. Model S6 Chicago USA, spotlight with long shaft white handle, GE bulb, (Sold). 2.) Unity MFG. Co. Model S6 Chicago USA, spotlight with short shaft black handle, GE bulb, (Sold). 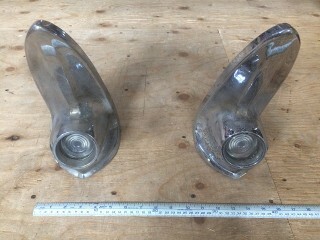 1961 Chrysler 300 fin chrome lights, they measure 14 1/2" high by 6" wide and have a 2" diameter clear lens, asking $85. for the pair. 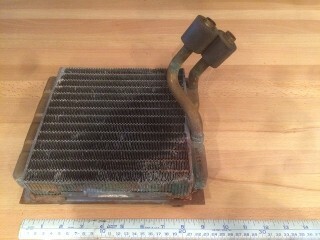 Used 1966 Dodge Polara copper heater rad, it measures 9" x 8" x 2", asking $25. 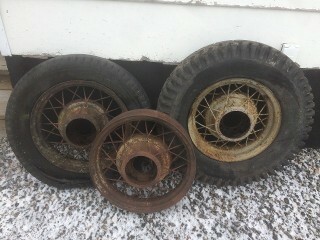 Three 1930's Ford wire rims, asking $60. each. 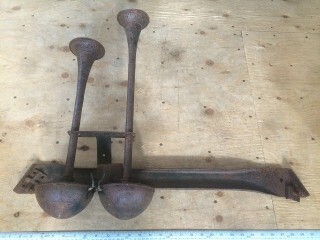 Antique dual truck 18" & 22" long horns with 30" mounting bracket, (Sold). 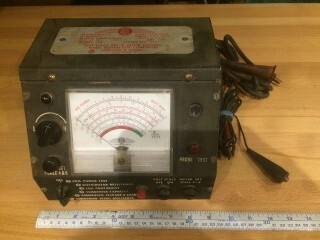 Vintage Merc-O-Tronic Instruments Corp.tester, model #98 for Coil power test, Distributor resistance, Coil continuity, Condenser capacity, leakage, shorts, & series resistance. (Sold). 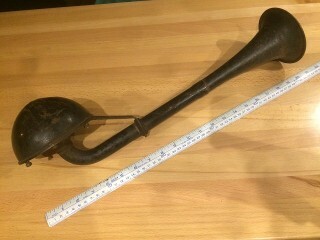 Antique 20" long car horn, asking $45. 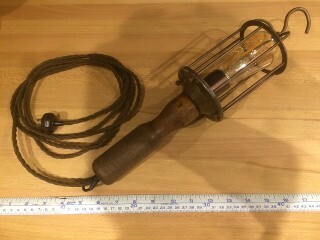 1920'S antique american industrial trouble light with a maple wood handle, (Sold). 1.) Set of 9" tire irons, one says Goodyear on it, asking $25. 2.) Set of 3/4" x 28" & 25" tire irons, $40. 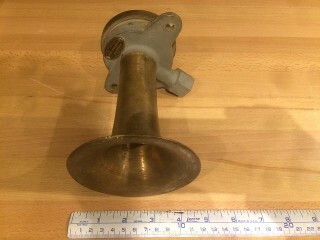 Antique solid brass 2 1/8" dia. cylinder suction pump with wood handle & base, asking $45. 1.) 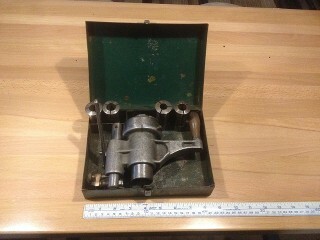 antique 1934 side movement #206 truck screw jack, Good working condition, asking $30. 2.) 1960 Bilstein Volkswagen beetle, bug, VW or Porsche jack, (Sold). Made in Germany. 4.) Drednaut model S-41205 twin bumper jack, (Sold). 5.) 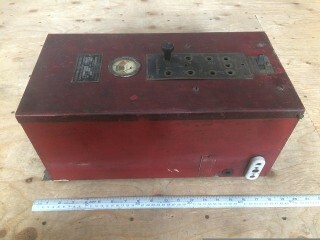 S&H Industries heavy duty push-pull Body mate automotive autobody tool, asking $60. 6.) Auscollet by Auto Specialties MFG. Windsor, Ont. asking $40. 7.) Two Puljak monkey on a stick, friction jacks, asking $30. each. 8.) 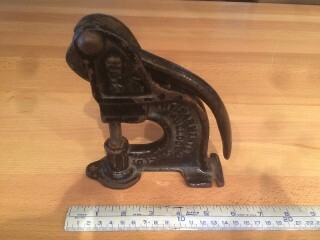 Antique puller c-clamp automotive tool, asking $20. 9.) 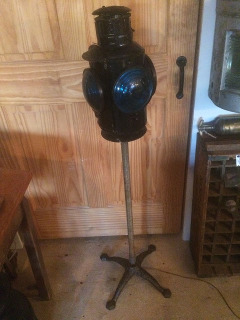 Antique bumper simple screw rod jack, asking $25. 10.) 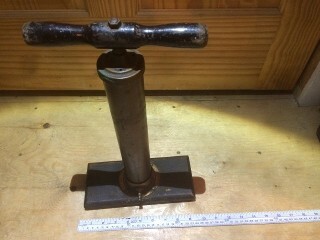 Antique brass tire bead breaker hand tool, asking $50. 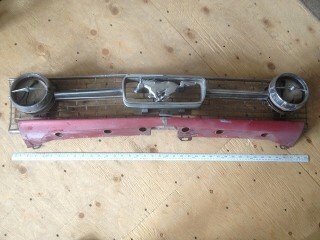 Antique 1966 Dodge Polara car parts from grandpa's garage. 1.) 2 Dodge hub caps, asking $30. 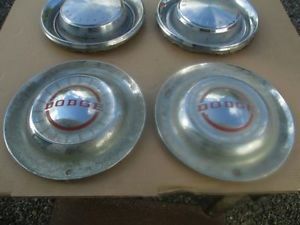 2 Chrysler hub caps, (Sold) . 3.) 1966 Heater rad , asking $25. 5.) 1969 Dodge starter, 12 volt Delco, asking $30. 6.) 1957 or 1958 Dodge spears hood ornaments, (Sold). 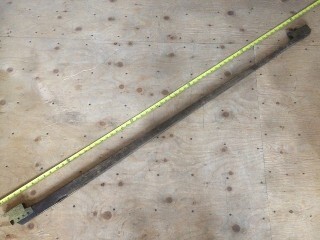 The double hood spears (Sold) for a 1957 or 1958 Dodge Custom Royal Lancer, or Dodge Coronet, or Dodge Desoto, or Dodge Wagon, or Dodge Regent, or the Dodge Charger. 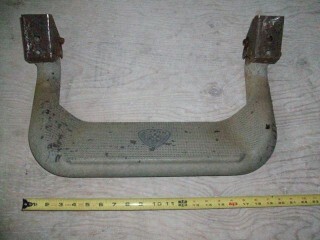 The single hood ornament is 6 3/4 inches long by 1 1/2 inch wide by 2 inches high and has 4 screw holes in the base of it. I'm not sure what it came off of. asking $20. for the hood ornament. Single plates are $10. to $20. each. Match sets are $40.to $60. per set. 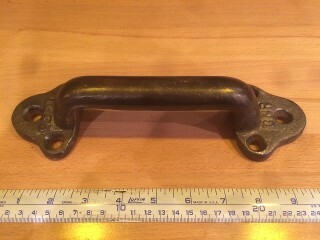 Antique blacksmith forged chain lifting eyebolt attachment for lifting motors, asking $65. 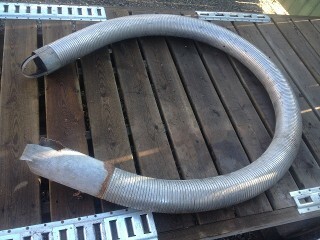 Flexible exhaust tube for garage, 4" diameter by 9 1/2 feet long, asking $60. 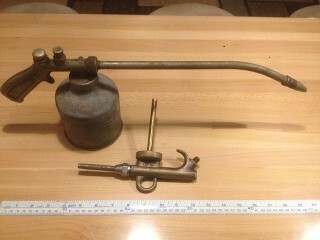 Antique Balcrank Oil Spray Gun Type HM Cincinnati Ohio USA Patent Number 1.762.552 Oiler & Solid brass No. 37 oil spray gun, they both fit on the same can, asking $45. for the pair. 1.) 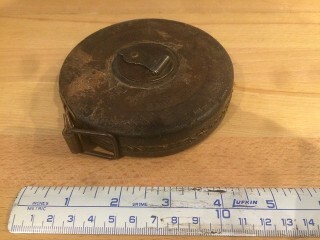 Antique Gas station can with screw on lid, it measures 10" dia. X 16" high, asking $85. 2.) Antique Gas station can with screw on lid, it measures 12 3/4" dia. X 18" high, (Sold). 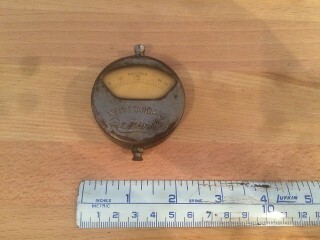 Antique New Standard ReadRite, Made in USA, Pat'd Sept. 9, 1913, it measures 2" diameter by 5/8" high, amp meter, asking $25. 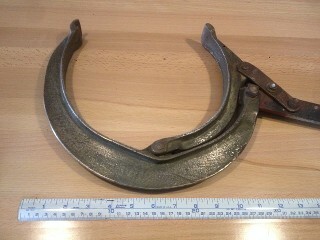 Antique '87 Conestoga wagon jack, it measures 24" x 7 1/2" x 3 1/2" closed, (Sold). 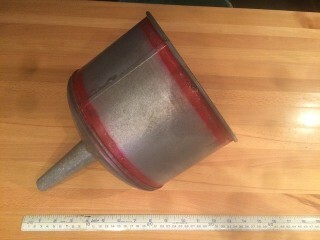 Vintage Simons Eastern Ltd. #28-3133 galvanized funnel, Made in Waterloo, Ont. 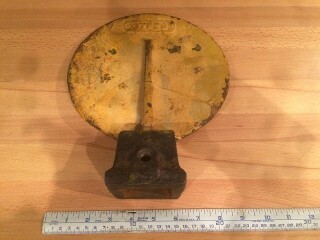 it measures 9" dia. x 12" high, asking $25. 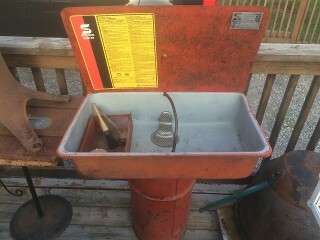 Vintage Safety-Kleen solvent-based parts washer, drum mounted cleaning cabinet, the pan measures about 20" x 30" x 6" deep, asking $120. 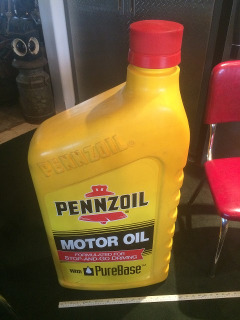 Pennzoil Store, Garage, Gas Station, advertising display 40" tall x 19" x 10" Pennzoil motor oil bottle, (Sold). Vintage Alemite high pressure bucket hand pump model #4161 on a 3/4 full 35 lb. 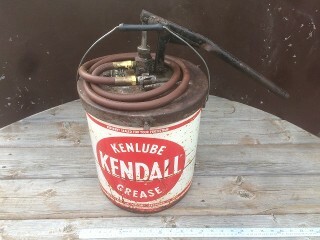 bucket of Kenlube Kendall Grease, works good, asking $85. 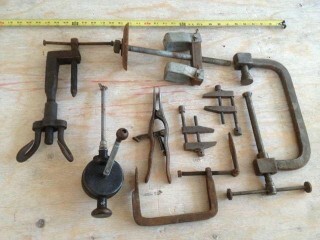 Vintage P-D-Q wheel weight removers, pliers, cutter, hammer, screwdriver, combination tool, asking $20. each, only one left for sale. 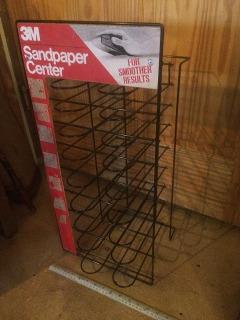 Hardware store sandpaper rack stand, it measures 12" x 11" x 25", asking $25. 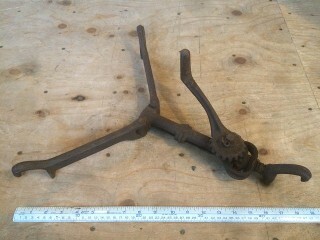 Antique Pacific Rim Tool Jr, for Ford model A or T split rims, complete and works, asking $45. Aluminum super hoop truck step with steel multi mounting brackets on it, It is made by CARR, http://carr.com to see the details and the quality. asking $35. 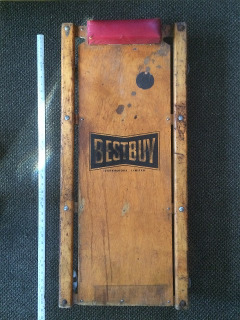 Vintage classic Bestbuy mechanics creeper, was going to make a coffee table for the man cave with it and never did, still works great as a creeper also, asking $25. 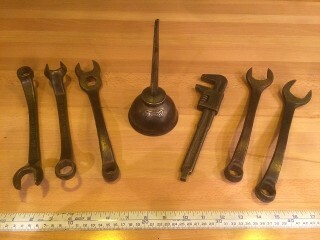 Vintage mechanics tools that came from an old gas station garage that closed down. 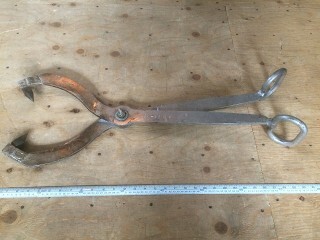 Some look like custom made specialty clamps, pullers, tools. asking $10. to $30. each for those. Some are (Sold). 1.) 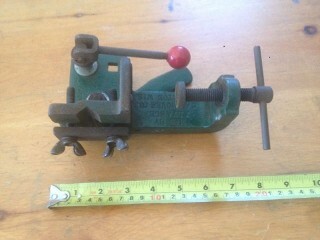 Vintage Zim valve lapping tool, asking $25. 2.) 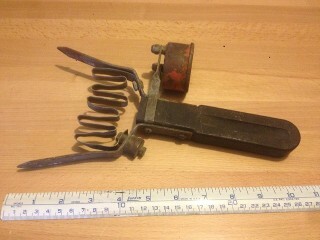 Antique valve lapping tool for Ford model A & T, asking $45. 3.) 3/4 full can of Clover Compound silicon carbide lapping compound, asking $20. 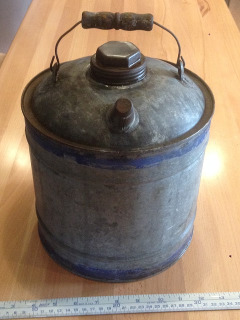 Vintage 2 gallon fuel oil or kerosene galvanized can, doesn't leak, measures 9" diameter 10" high, asking $20. Vintage car hop drive-in window food tray, pastel blue green, Serv-a-car Products, Inc. Parsons, Kansas, it measures 13 3/4" x 9 1/2" x 3 1/2", asking $25. 1939 Rite Tool Inc. Auto armature commutators hand lathe tool, by John L. Mansfield, for turning and slotting commutators by hand. It is designed for reconditioning armatures for GM, Ford, and Chrysler cars and trucks. It comes with 4 collets, sizes .562, .625, .635 and special .669 collet for 1941-42 Ford , with metal case, Patent #2145091, asking $45. 2.) 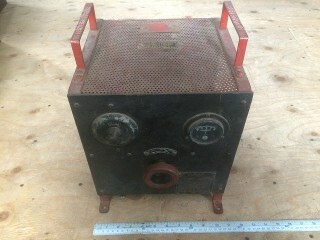 Vintage Heyer Industries Inc. universal compression tester, model 345-A, (Sold). 3.) 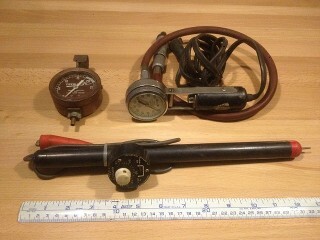 Vintage Peerless engine vacuum and fuel pump tester, 0-25 pounds, (Sold). 2.) 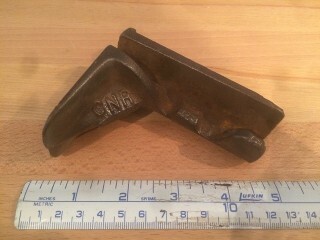 Antique wagon wheel 1" square wheel lug nut hand T-wrench, asking $50. 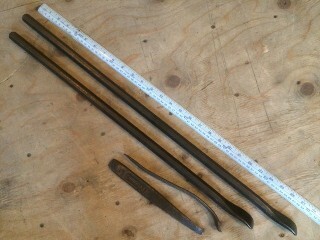 Antique solid brass or bronze tire bead breaker with 32" long steel handle, asking $50. Antique 1902 The Parmenter & Bulloch MFG. Co. LTD. Ganonoque, Ont. 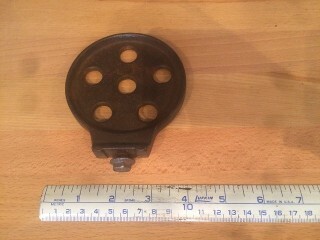 # 2 cast iron rivet setter for brake shoe linings, asking $45. 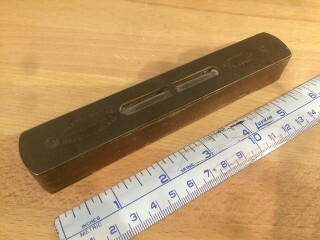 Antique battery cell tester tool, (Sold). 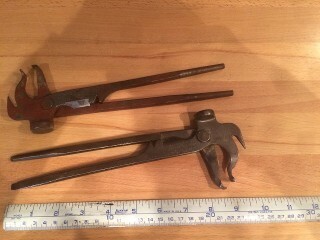 1926 BESCO 9857 Giant Battery Terminal Pliers, asking $35. 1.) 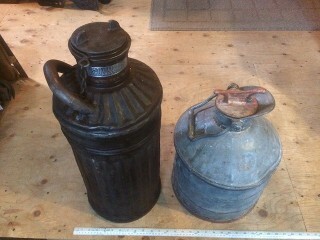 Antique Ford oil can, (Sold). 2.) 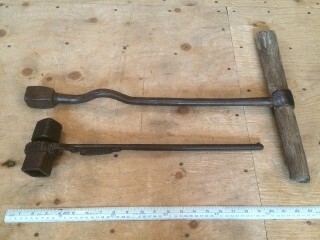 Ford model A & T wrenches, asking $20. each. 3.) 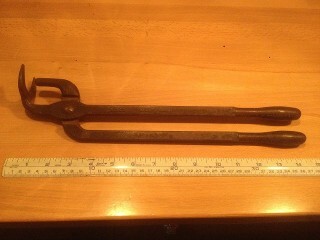 Ford model T T truck wrench, asking $25. 4.) Ford 1927 adjustable wrench with square oil plug wrench end, Made. 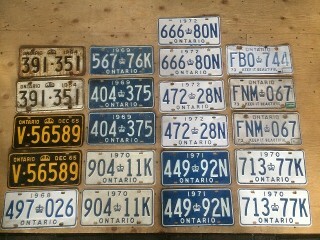 By McKennon Industries, $35. 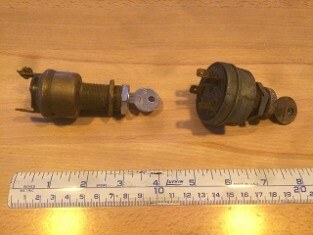 Two antique car or truck ignition starter control switches with keys, asking $45. each. Johnson Sea Horse 5 Hp. Two vintage 1950's Johnson Sea Horse 5 Hp. 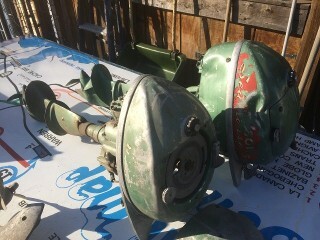 model TD-20's motors, one looks complete and the other was used for parts, asking $160. for the pair. 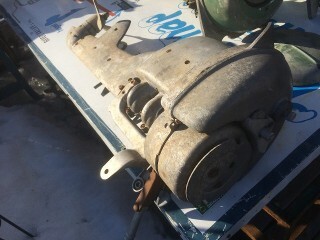 Small antique boat motor, don't know what kind this is, it has no markings on it. Asking $75. 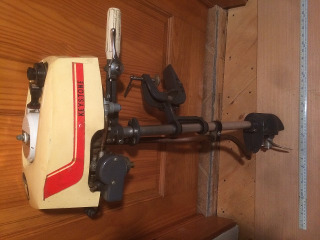 Vintage Keystone TOB/12 trolling 1 1/2 hp.motor, 12 lb backpack motor (Sold). Vintage 25 lb. 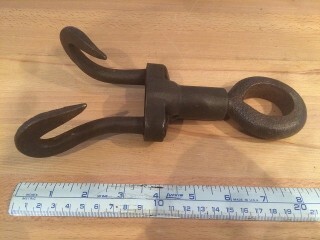 Northill Co. Inc. Seaplane or boat anchor type-12R ,Los Angeles Calif. It measures 29" lg. 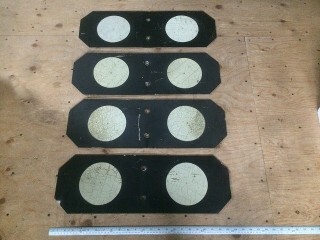 x 21" across the flukes, asking $160. 1933 Antique 6 lb. 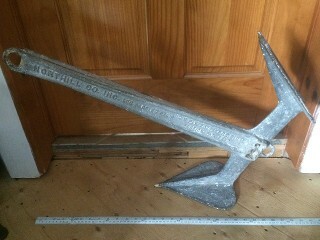 Northill Co. Inc. Seaplane or boat anchor type-3R Certified ductilon ,Los Angeles Calif. U.S. Pat. 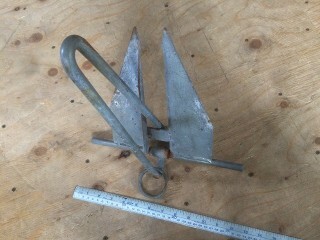 2075827RE21841, Anchor measures 18" lg. x 13" across the flukes, (Sold). 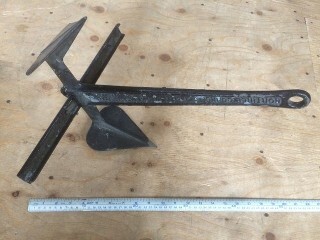 Steel flip style Danforth boat anchor, it measures 12" x 15" and weighs 4 1/2 lbs. asking $20. 1.) 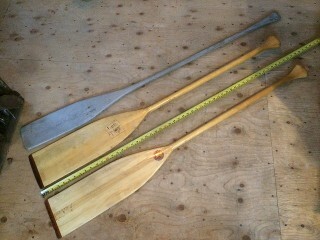 Hand carved grey weathered ash wood, stand-up paddle, 59 1/2" long x 5 1/4" wide, asking $35. 2.) Northern Boundary wood paddle with hard resin tip, 53 1/2" long x 7" wide, asking $35. 3.) Upper Canada Paddle Co. Wood paddle with hard resin tip, 53 1/2" long x 6 7/8" wide, asking $35. 1.) 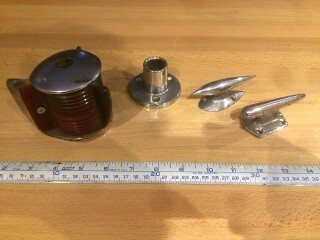 Vintage tie downs and light pole holder, $10. each . 2. 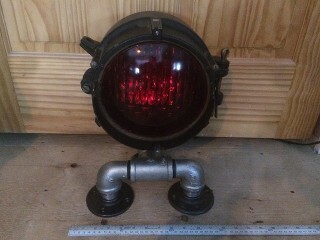 )Vintage chrome port & starboard boat light fixture, it measures 3" x 3" x 7", asking $20. Vintage solid brass Federal Sign and Corp. Chicago, air whistle horn, Size 3M, Pressure 65 125, weighs about 4 lbs. asking $125. 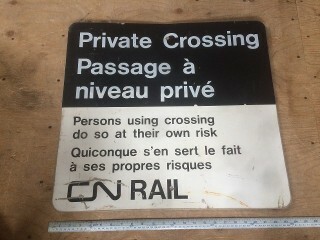 Vintage rail road CN rail private crossing aluminum sign, 24" x 22" , French & English, asking $65. 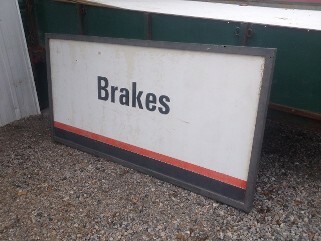 Vintage rail road, CN rail black & white dots snowplow signs, asking $10. each.. 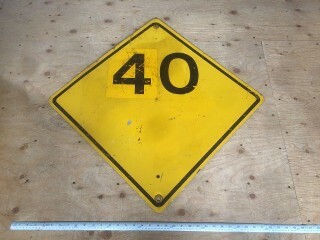 Antique CN Rail train speed limit sign, 24" x 24" heavy gauge aluminum sign, (Sold). 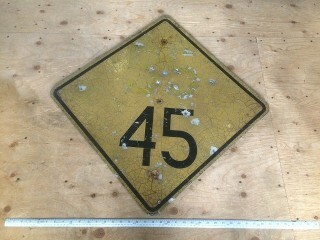 Antique CN Rail train speed limit sign, 24" x 24" heavy gauge aluminum sign, asking $60. 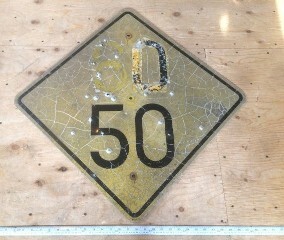 Vintage CN Rail train speed limit sign, 24" x 24" light gauge aluminum sign, asking $50. 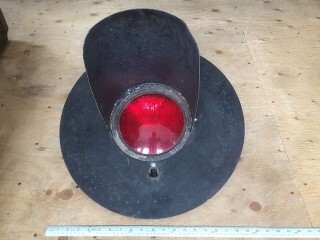 Railroad Railway Crossing Light, asking $100. 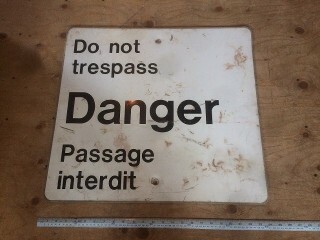 Vintage CN rail Do not trespass Danger aluminum sign, 24" x 22", (Sold). 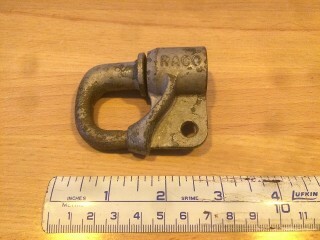 Vintage Raco railroad signal box screw lock, (Sold). 1.) 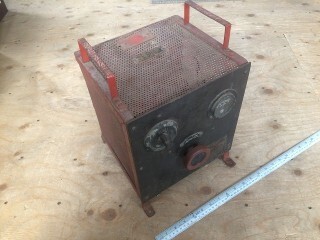 Hiram L. Piper Co. Ltd. Adlake Kero 1-53 patented Railroad lantern, (Sold). 2.) 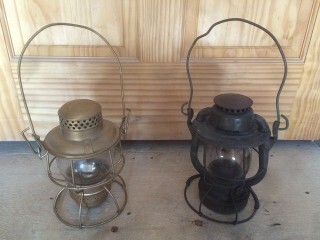 Dietz Vesta Railroad lantern, asking $90. Heavy duty CN aluminum tie tongs, #CN-B84 with removeable hardened steel tips, (Sold). Antique cast iron train station platform scale with pull handle, Made by The National MFG. 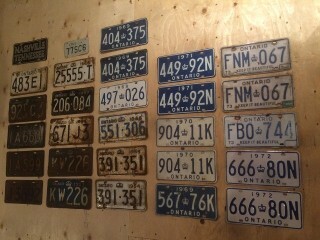 Co. Pembroke, Ont. It measures 24" x 44", weighs up to 2000 lbs. Back wheels don't turn, asking $720. 1.) 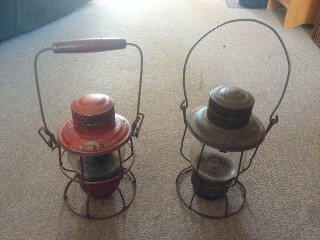 One red 1920's C.P.R lantern, The Hirams L. Piper Co. Ltd. with Adlake Kero short globe, $85. Antique 1950 M series Nathan Airchime locomotive air horns from The Holden Co. Ltd. serial #3014, model #M3H it has the #2, #3, and #4 bells that measure 9", 11", and 13". 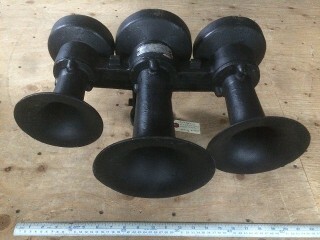 It has a heavy cast iron manifold, they weigh about 25 Lbs. (Sold). 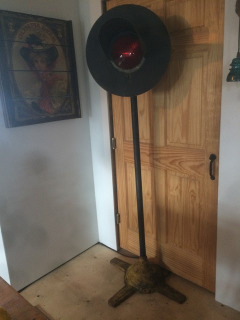 Antique railroad railway crossing table lamp, the base is made with black iron, brass & galvanized industrial pipe fittings, it has an 8" diameter red globe and stands 15" high. The light works and has the original DC lights inside, it comes with a DC transformer. It could be set in the middle of your model train tracks and made to turn on when the train passes. Asking $280. 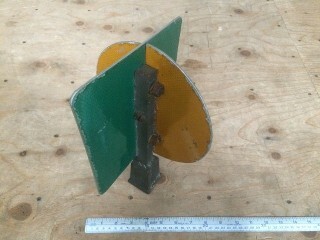 Vintage railway crossing light on a cast iron stand. It was completely rewired to 120 volts (Sold). Antique railroad track inclinometer grade level, with solid brass ends and brass level plate, it measures 60 1/2" long, asking $85. Track crossover switch top reflector, on a cast iron bracket for a 1" square post, it measures 8" x 8" x 11", weighs 4 lbs, (Sold). 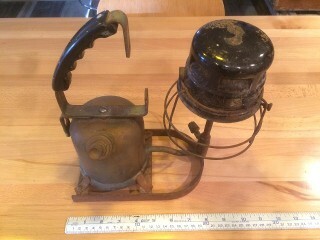 CNR RailRoad switch lantern, Piper Montreal with 4 glass lens, 120 volt light.(Sold). 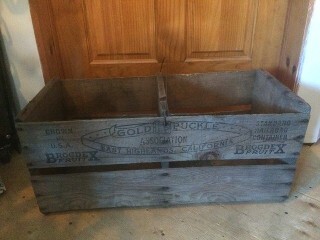 Standard RailRoad fruit container crate, Gold Buckle Association, East Highlands, California, Brodex Fruit, it measures 26 x 12 x 11 1/2", asking $55. 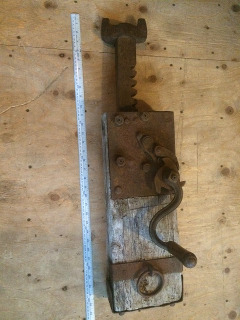 Antique Heavy cast iron track switch top plate,it measures 8 1/2" x 11" high, weighs 8 lbs, (Sold). 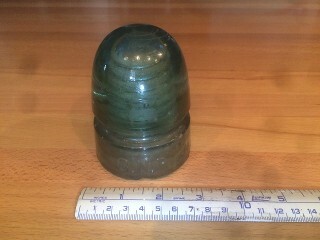 Antique CNR RailRoad beehive style telegraph insulator, asking $25. Antique C.N.R. 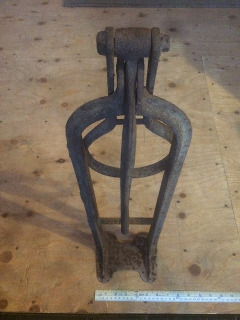 jack foot attachment, asking $20. J. Rabone & Sons Made in Birmingham England, antique C.N.R. 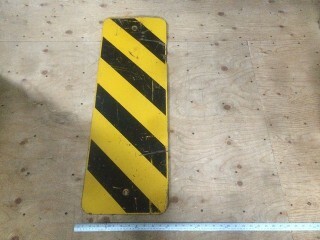 6" level, asking $40. The Lufkin Rule Co. antique leather case 60' cloth tape measure C.P.R. tape measure, $40. 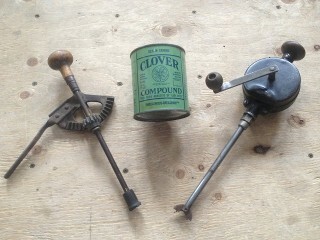 Keystone Railroad hand crank tool grinder, Keystone Grinder & Mfg. Co. Rochester Pa. (Sold). 1.) 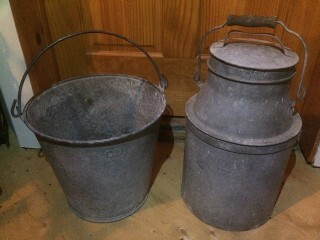 CN embossed 12" diameter x 11" high pail, $35. 2.) CNR LOCO embossed canester with lid, 10" diameter x 15" high, weighs 9 1/2 lbs. asking $95. 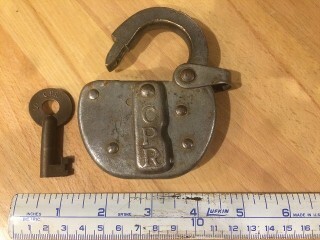 Antique CPR lock with solid brass clasp & key, it measures 3" x 3 1/2", and weighs about 3/4 lb. (Sold).